Photography is big business in Egypt these days, but there’s one man who walks among us who stands as the most established and fascinating of them all: Steve Double. The Cairo-based British photographer has photographed some of the biggest celebrity names in the world, but it’s his extensive work in the world of music that is on display at Maadi bar, the Tap. Showing for the whole month of April, Here We Are Now is a collection of Double’s favourite photographs and features an eclectic array of music superstars. What will strike you first about the exhibition is how expertly it has been put together along the walls of the Maadi bar; the Tap’s decor in itself is distinctive, but Double’s pieces, most of which are black and white, feel neither intrusive to the aesthetic of the bar, nor do they fade into it. This is owed largely to the keen eye of the photographer himself, whose photographs demand your attention. Speaking to Cairo Gossip in a recent interview, Double’s approach to his subjects is a mutual exchange. “I don’t like to think of it as me taking their photograph. I like to see it as us making a photograph together.” It’s an ethos that gives his photographs depth and character; his subjects are at ease and in their element. No photo shows this more than one of Alice Cooper. Emerging out of a background of darkness, the close-up image of a posturing Cooper captures the legendary rocker’s eccentric persona and it exudes a sense of mischief and playfulness that also appear in photos of U2 front-man, Bono, and Icelandic queen of quirk, Bjork. 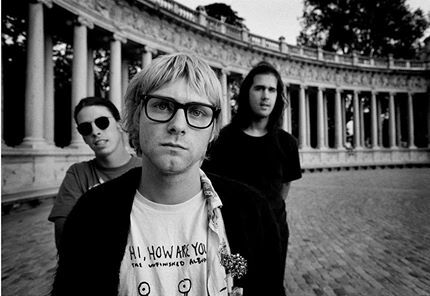 One of his most iconic photos is that of Nirvana in 1992. Taken in Madrid, the focus of the photograph is very much Kurt Cobain, with band members, Dave Grohl and Krist Novoselic, emerging from behind him, which gives the piece a sense of movement. But it’s Cobain’s ambiguous expression that really pulls the eyes; there’s an aggression and intensity, but also a sense of anxiety and despair – two things that famously plagued his career. The biggest feat of this collection is that, even though Double pulls his subjects individual qualities, there’s a strong, intangible spirit that links all of them. There’s an edginess, candidness and rebelliousness that ties them together – be it of more contemporary artists such as M.I.A and Eminem, or legends of years gone by like Iggy Pop and Michael Jackson. The exhibition as a whole captures a certain type of grandeur; Double doesn’t impose himself on his subjects and the autonomy he gives them has made for a collection of fascinating and engaging photographs. All photographs are for sale and prices start at a very reasonable 1900LE, with 10% of all profits going to the Maadi Orphanage. Next time you're on the Tap's dancefloor, look up. The sheer magnitude of the musicians on show is astounding and pays a fitting tribute to Double's remarkable career. A busy bar isn't necassarily the easist place to appreciate art in. In fairness, however, the collection is displayed effectively.